We’d love your help. Let us know what’s wrong with this preview of Of Mess and Moxie by Jen Hatmaker. In this highly anticipated new book, beloved author Jen Hatmaker parlays her own triumphs and tragedies into a sigh of relief for all normal, fierce women everywhere. Whether New York Times bestselling author, Big Sister Emeritus, and Chief BFF Jen Hatmaker returns with another round of hilarious tales, shameless honesty, and hope for the woman who has forgotten her moxie. To ask other readers questions about Of Mess and Moxie, please sign up. Would this book be a good book to read with a group of High School girls or is it geared more toward adults? Jennifer Hayes Adults. Particularly moms. Somewhere along the way I got the idea that Jen Hatmaker was mainstream and orthodox. I had seen her books around and had the idea that she wasn’t really anything radical...just another nice women’s teacher. But then last year I heard of her response to the Nashville Statement and I have to say I was absolutely floored. So then this book came out and hit the bestseller lists and was very present in the bookstore. I love the cover and I loved the premise, so I cracked the cover to see what she is Somewhere along the way I got the idea that Jen Hatmaker was mainstream and orthodox. I had seen her books around and had the idea that she wasn’t really anything radical...just another nice women’s teacher. But then last year I heard of her response to the Nashville Statement and I have to say I was absolutely floored. So then this book came out and hit the bestseller lists and was very present in the bookstore. I love the cover and I loved the premise, so I cracked the cover to see what she is like. Right away, she was outgoing, personality plus, and very sure of her own opinion. So far so good. Witty. But then little things popped up, then bigger things. Hang on and I’ll mention the reasons I left the book at the bookstore. I read the beginning section and then various other sections through the book to see if it got any better. -She is actually quite snobby. While preaching about love she refers to people who don’t agree with her in terms like “The pointy-finger old church lady” and describes how she and her pals made fun of her. She speaks from an area of affluence and talks about all the little things that get on her nerves...really, in the end, I know she has struggled with the idea of affluence before because she wrote 7, but her complaints are mainly very very first-world complaints. It sets a tone that, although humorous, is irksome to someone like me who is working three jobs to make ends meet as a single woman. And I feel like she’d laugh at me and find a name to call me if she heard me disagree with her opinion. -Drinking. This one was a big one for me. I don’t think it’s wrong to drink as long as it isn’t to the point of drunkenness, but alcoholism is a huge problem in society, and for a spiritual leader to have it so present can lead others into thinking it’s okay to drink all the time until it’s too late and they are addicted. Seriously, every chapter had mention of wine or drinks or something of the sort. If a recovering alcoholic got their hands on this book I’d hate to see the consequences, because it’s portrayed as a normal and enjoyable and expected part of relaxation and friendship. -“White lies.” I didn’t see her use the term, but throughout the book are multiple instances of her using deception and/or manipulation to gain the end she wants. It seems harmless to do one’s child’s schoolwork for them when they run out of time, right? Seems necessary to grab a hammer and pretend to be ready to fix something around the house in order to get one’s husband off the couch and ready to fix something? But it’s clear from her humorous commentary that she does these things for the purpose of getting the job done by someone other than herself (then why pretend to do it?) and so that her kid can get a passing grade (it’s not the kid that just passed the grade, it’s you who did. Woo hoo, graduated adult....) By having us laugh at cute/funny/whimsical bits like this, it cheapens the effects of truth and deception and makes deceptive behavior acceptable. Yes, the famous lists are laughable and relatable. But to say that she actually does some of those things lends a stamp of approval to that type of behavior. Other people will hush the voice of conscience because Jen does it too and they laughed over it with Jen. -Cussing. Taking the Lord’s name in vain and using forceful vulgarities. -Put-down of Jesus. “Hey, pray straight to God when you have marriage troubles. Jesus wouldn’t get it because he wasn’t married.” UHHHHHH. 1) Jesus understands everything 2) When was God married? Hannah Thanks, Dara. That’s so true. Jen Hatmaker does it AGAIN! If you read and loved her previous book, For The Love, then this book is for you! I laughed so hard at the hilarious parts...and then cried real tears as she reached down into the tender places that needed her words. Jen tells the truth and then wraps it up with a sassy bow. 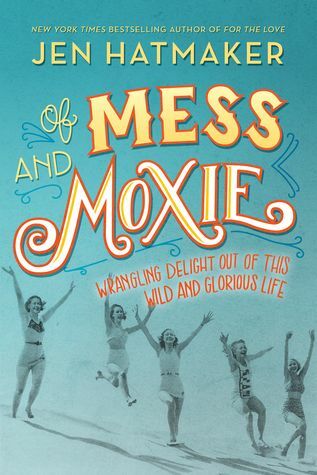 Of Mess And Moxie is another gift to the world. I received an advance reader copy from the publisher. Of Mess and Moxie has given me permission. Permission to be exactly who I am, permission to create, permission to fight for what I believe in and to build the kind of rich, wild, moxie-filled community that exudes love, grace and acceptance. "This wild and glorious life" is so full of joy and with these permissions, we can live it freely! As a 30 year old single woman, books like Of Mess and Moxie can make me nervous. I don't need the reminder that I'm single, or childless when I so desire those Of Mess and Moxie has given me permission. Permission to be exactly who I am, permission to create, permission to fight for what I believe in and to build the kind of rich, wild, moxie-filled community that exudes love, grace and acceptance. "This wild and glorious life" is so full of joy and with these permissions, we can live it freely! I'll start with all the good things first, because it kills me to write a negative review of anyone's book - it makes me feel bad. On the positive side, I loved the handful of recipes Jen included (Jen's Grocery Store Day Super Sandwich, Panang Chicken Curry, various smoothie recipes, Aunt Carol's Crunch Salad, Buffalo Chicken Dip, Bacon-Wrapped Stuffed Dates, Fried Chicken Sliders With Honey Dijonnaise) and am excited to make them. I'm a big foodie and I LOVE to cook, so this was a fun addition for me. I also enjoyed many of the hilarious How-To lists (there are four collections of these scattered throughout the book), especially "How To Shop At Target", "How To Plan A Family", "How To Get Your Husband To Fix That Thing He's Been Saying For Three Months That He'd Fix", "How To Ensure People Feel Compelled To Pop In For A Visit", "How To Find A Family Pet", and "How To Find A Missing Child". Jen is a gifted writer and very funny. I enjoy reading her hilarious real life stories and can relate to many of them. She seems like someone that would be super fun to hang out with and is obviously very earnest in her beliefs and wants to minister to women and help women grow and cultivate friendships. I did highlight a handful of insights that I found helpful, such as her discussion of God not giving us a spirit of fear on pages 39-40. This really spoke to me and I appreciated her insight there. The other part I really enjoyed was the last chapter, Rewoven (pages 243-250). Jen takes the story of Joseph and shows how God rewove all the tattered shreds of his life into something good, and He will do the same for us. That was an encouragement to my heart. The cover of the book is also super cute! I started off by reading the praise in the beginning for the book. Instead of using celebrity endorsements, she opted to use endorsements from her "tribe" - her Facebook group/launch team. I like seeing reviews from real people, so this seemed nice - until I started reading them. With multiple mentions of craft beer and drinking wine, Netflix, irreverence, and "feeling all the feelings", it was pretty clear that the target audience for this book is upper-middle-class hipsters in their 30s-40s (not my demographic - I'm in my early 30s, but decidedly not a hipster in any way, shape, or form, and sadly not upper-middle-class). Never fear though, the reviewers didn't write the book, Jen did, so I'm not going to judge a book by its reviewers. Then I started turning the pages. I ran into problems just in the Introduction - she immediately mentions drinking alcohol, then proceeds to call out and publicly shame a woman who wrote a warning against Jen's ministry/theology/etc, calling her "an older gal" (right after saying this book is for all ladies, young and old), and calling it a "church-lady-finger-wagging article". This made me feel super, super uncomfortable as Jen's mantra is supposedly being all-inclusive and grace-filled/loving to EVERYONE. However, the Introduction closes on a high note of stating that we don't have to wait for a Someday Life to enjoy the life we have right here in front of us and promises to show us how we can find our moxie in the middle of our boring, ordinary lives. Pushing away my uneasiness and feeling mildly inspired, I went ahead and turned to the first chapter. Things got more and more difficult from there. On page 2 of the book, there is a curse word. In fact, at final count, the book contains at least five different curse words throughout. I'm pretty surprised a Christian publisher (Thomas Nelson) is okay with publishing a Christian book with cursing sprinkled throughout, but maybe that's just me. All I know is that I expect Christian books to be edifying, and cursing is not really aligned with that goal - James 3:10 immediately came to mind ("Out of the same mouth proceedeth blessing and cursing. My brethren, these things ought not so to be.). It felt like she was trying to be edgy and cool (I'm a Christian, but I can still curse!) but it left me with a bad taste in my mouth (no pun intended). She also comes off as very irreverent in many of her comments. Moving on, the next thing I noticed was the near-constant positive reference to drinking alcohol. Jen appears to glamorize drinking throughout the book. She talks up Happy Hour with friends, drinking wine at home, going out for margaritas, and more, over and over and over again. In this 254 page book, drinking alcohol is mentioned (in a positive light, and glamorized) at least 30 times. In fact, it's mentioned in nearly every chapter. Let that sink in for a minute ... especially for those of us who come from alcoholic homes, families, and/or have struggled with drinking ourselves before getting saved. Romans 14:21 kept playing through my mind as I read this book: "It is good neither to eat flesh, nor to drink wine, nor any thing whereby thy brother stumbleth, or is offended, or is made weak." Not only does Jen make it seem like it's a-ok for Christians to drink alcohol frequently, she normalizes it and makes you feel as if you're missing out on something fun and exciting if you don't partake. This is egregious to me in a culture where drinking is such a serious issue that many people, Christians and non-Christians, struggle with. The Bible has much to say about alcohol and drunkenness: Ephesians 5:18 (And be not drunk with wine, wherein is excess; but be filled with the Spirit;) which suggests you are not filled with the Holy Spirit when you are filled with wine; the story from Genesis 9 where Noah gets drunk and his son exposes his nakedness; Genesis 19 where Lot gets drunk and his daughters sleep with him and become pregnant by him; Leviticus 10:9 (and many others) warning against drinking "wine and strong drink"; Proverbs 20:1 which warns "Wine is a mocker, strong drink is raging: and whosoever is deceived thereby is not wise. "; Proverbs 23:20 which warns, "Be not among winebibbers; among riotous eaters of flesh:"; Proverbs 23:29-35 which is very clear about the problems with wine and alcohol ("Who hath woe? who hath sorrow? who hath contentions? who hath babbling? who hath wounds without cause? who hath redness of eyes? They that tarry long at the wine; they that go to seek mixed wine. Look not thou upon the wine when it is red, when it giveth his colour in the cup, when it moveth itself aright. At the last it biteth like a serpent, and stingeth like an adder. Thine eyes shall behold strange women, and thine heart shall utter perverse things. Yea, thou shalt be as he that lieth down in the midst of the sea, or as he that lieth upon the top of a mast. They have stricken me, shalt thou say, and I was not sick; they have beaten me, and I felt it not: when shall I awake? I will seek it yet again.") I understand some Christians believe that you may drink alcohol so long as you do not get drunk - as the Bible is extremely clear that drunkenness is a sin - but I refer back to Romans 14:21 and not causing unbelievers, new believers, and non-Christians to stumble, or to give a bad testimony. But moving on from alcohol, another issue I have with Jen is her seeming to be wishy-washy and flip-flopping constantly. Over the past decade or so she's gone from a traditional preacher's wife holding orthodox positions, to a minimalist, to a social justice warrior and advocate for the poor, to her current position(s). She even states "When people read my books out of order, they are like, Wait, what?" A warning bell went off as James 1:8 popped into my mind: "A double minded man is unstable in all his ways." She seems to have a problem nailing down one belief system to live by, and while I completely understand and advocate for growth and healthy, positive change, certain things don't change. We have the Bible as our unchangeable, unerring guide to life and certain things are set in stone. Her constant changing is a warning sign to me that she's not stable minded. Another disturbing thread woven throughout the book is Jen's dismissing of salvation, repentance, and sanctification and emphasis on "love" and "grace". On page 82, in the midst of a discussion about loving sinners, she writes, "You can love truly, without conditions, without agenda, without a fork in the road, without disapproval, without fear, without obligation. You can love someone with a different ideology, different religious conviction, different sexual identity, ideas, background, ethnicity, opinions, different anything. You can love someone society condemns. You can love someone the church condemns. You have no other responsibility than to represent Jesus well, which should leave that person feeling absurdly loved, welcomed, cherished. There is no other end game. You are not anyone's savior; you are a sister." While this sounds good and lovely and Christlike on the surface, in reality it is not entirely true. There is a kernel of truth to it - Jesus calls us to love our neighbor as ourselves (Matthew 22:39) and says that people will know we are Christians because of how we love (John 13:35). However, Jesus never just loved people and left them in their sin. He loved them, but required repentance - such as the story of the woman at the well when Jesus doesn't condemn her, but tells her to go and sin no more (John 8:11). Jesus never leaves someone in their sin without calling for repentance of that sin. We can love people abundantly, but we are commanded to share the Gospel with everyone so that they can repent and be saved, such as in the Great Commission (Matthew 28:19-20). And we are never called to have our closest advisers and closest friends be unsaved people. In fact, the Bible warns of this over and over: "Be ye not unequally yoked together with unbelievers: for what fellowship hath righteousness with unrighteousness? and what communion hath light with darkness?" (2 Corinthians 6:14); "Can two walk together, except they be agreed?" (Amos 3:3); "Blessed is the man that walketh not in the counsel of the ungodly, nor standeth in the way of sinners, nor sitteth in the seat of the scornful." (Psalm 1:1); "But now I have written unto you not to keep company, if any man that is called a brother be a fornicator, or covetous, or an idolater, or a railer, or a drunkard, or an extortioner; with such an one no not to eat." (1 Corinthians 5:11); "A man that is an heretick after the first and second admonition reject; Knowing that he that is such is subverted, and sinneth, being condemned of himself." (Titus 3:10-11); etc. People should feel welcomed, accepted, and loved in our churches, homes, and lives, but not to the exclusion of overlooking sin or preaching the whole counsel of God. We don't want people to die and go to hell because we didn't share the full Gospel with them so that we wouldn't make them uncomfortable or appear unloving - in fact, I believe is is more unloving to NOT share the full Gospel of Jesus Christ with people for fear of offending them, because their eternal soul is on the line. Finally, Jen advocates for women preaching and holding leadership positions in the church (page 127), which is clearly forbidden in the Bible, in 1 Timothy 2:12 and other places: "But I suffer not a woman to teach, nor to usurp authority over the man, but to be in silence." Women should absolutely teach and train other women as Titus 2 suggests, but should not be preaching from the pulpit on a Sunday morning or leading men in the church. This is clearly unbiblical. She also references watching a number of TV shows that I would consider a bit inappropriate (Breaking Bad, Parenthood, etc) and references them in a positive light. The entire tone of the book seems worldly, rather than pointing to Christ and the new life we can have in Him. Overall, Of Mess And Moxie is heavy on the superficial and fluff and very low on Scripture, biblical applications, and edification. The Bible and Jesus are rarely mentioned and seem to almost be an afterthought in certain portions. If you took out a few handfuls of sentences, it could be a completely secular book. It's fun to read and seems good on the surface, but lacks any true depth or biblical underpinnings. It reminds me of 2 Timothy 3:5-7: "Having a form of godliness, but denying the power thereof: from such turn away. For of this sort are they which creep into houses, and lead captive silly women laden with sins, led away with divers lusts, Ever learning, and never able to come to the knowledge of the truth." If you are a Christian woman looking for a book to edify you and encourage you in your walk with the Lord, I unfortunately cannot really recommend this book. There are many, many wonderful (and funny!) books geared toward Christian women that are scripturally sound and have a ton to glean from, but this isn't one of them. I gave it 2 stars because there are some redeeming qualities, but the overarching problems are too many to recommend it. It might be a fun and lighthearted book for a mature Christian woman rooted in her faith to read (chew on the meat and spit out the bones), but I wouldn't recommend it to a new or baby Christian. I'm sure this won't be a popular review, but I just can't get behind much of Jen Hatmaker's theology. She unfortunately seems to have gone off the rails with this one. Hannah And you didn’t pick up on the condemnation and self-righteous judgment Jen displays in this book toward anyone who doesn’t agree with her? Anna Excellent review! You pointed out, and used Scripture to support, so many of the fallacies of quasi-Christian writings of today. With wit and whimsy, tenderness and tenacity, Jen Hatmaker once again balances the sacred and the sarcastic, giving her readers permission to admit their messes and live with unashamed moxie. Of Mess and Moxie was cathartic and refreshing, leaving me with a sense of having spent an afternoon with a familiar friend. I received an Advance Readers Copy of OMAM in exchange for an honest review. I'm giving this book a 3.5 star rating but rounding it up to 4 stars because I liked it more than my average 3 star but it isn't quite what I would consider a 4 (picky, I know). This was a funny, relatable, and meaningful read. I think it would suit a variety of age ranges and in different stages of life. Whether you are young, old, married, single, with kids, or without kids, I think there are parts of this book that will be relatable to all. I will disclaim though that this book is mostly geare I'm giving this book a 3.5 star rating but rounding it up to 4 stars because I liked it more than my average 3 star but it isn't quite what I would consider a 4 (picky, I know). This was a funny, relatable, and meaningful read. I think it would suit a variety of age ranges and in different stages of life. Whether you are young, old, married, single, with kids, or without kids, I think there are parts of this book that will be relatable to all. I will disclaim though that this book is mostly geared towards women. There probably will be some men that would enjoy it also but hey, when a section references "This One's For The Girls", it probable is more directed toward the female population. This book was the perfect combination of humour as well as topics that are difficulties in everyday life. Jen Hatmaker really did come across as a friend (or the inner workings of my own mind). Also included are recipes making this quite the well-rounded book. It includes serious introspective chapters, funny chapters to relate to, and laughable lists which are also relatable. I wanted to love this book. I follow her on social media, and she's warm and funny and sometimes makes me cry. She's one of those social media personalities that you feel like you know. I was excited to read this book; I was expecting it to be both funny and meaningful, and it was kind of both. Kind of. There were moments. But mostly it felt both preachy and brag-a-docious. For example: Her long section about her friend tribe felt like bragging. There was no advice on how to build one, just exam I wanted to love this book. I follow her on social media, and she's warm and funny and sometimes makes me cry. She's one of those social media personalities that you feel like you know. I was excited to read this book; I was expecting it to be both funny and meaningful, and it was kind of both. Kind of. There were moments. But mostly it felt both preachy and brag-a-docious. For example: Her long section about her friend tribe felt like bragging. There was no advice on how to build one, just example after enviable example of how awesome it is. I don't say this out of jealousy; I also have an amazing friend tribe. But the whole section read like "my friends are better than yours" and I kept thinking of the lonely struggling mom who lacks this kind of support. This is her demographic (middle class moms), and I bet it was painful for them to read. The section on being a little bit famous made me roll my eyes. ("I'm a human just like you! You should save your fan-girling for Jesus!" Seriously). The preachy parts felt super preachy. And the funny parts made me crack a smile, but it felt like she was trying too hard and it felt out of place with the rest of the book. I mean, be funny while you make a point or tell a story. I love that. But this was separate sections that were just random lists that she admits she stole from her Facebook followers. It's like she had a few essays and wanted to fill the pages to make a whole book. I really wanted to give this 5-stars because she and her husband took a brave stand in support of the LBGTQ community a few years back. This was a Big Deal in the Evangelical world in which they were big stars. It was brave of them, and they took a lot of heat. She only mildly hints at it in the book. I don't understand why she wouldn't just lay it on the table here; what was all that flack for if she still just dances around it? Of Mess and Moxie is Jen Hatmaker's love letter to the girls - the young ones, the old ones, the ones in the middle - who are walking this journey of life in all it's joy and sadness. The girls who are nailing it and the girls who feel like they just don't measure up. The girls who have it all together and the girls who feel like they only ever fall short. The girls who feel "just medium", who are afraid they are messing it all up and can't see how brightly they actually shine. So, really, for a Of Mess and Moxie is Jen Hatmaker's love letter to the girls - the young ones, the old ones, the ones in the middle - who are walking this journey of life in all it's joy and sadness. The girls who are nailing it and the girls who feel like they just don't measure up. The girls who have it all together and the girls who feel like they only ever fall short. The girls who feel "just medium", who are afraid they are messing it all up and can't see how brightly they actually shine. So, really, for all of us. This book is funny, poignant, smart, kind, honest ,affirming, and full of joy. It's like a 4-hour talk with your best friend. It is the embrace of sisterhood that all women need. Jen Hatmaker says she is forever our fangirl - well, I'm forever hers. Highly recommended. Read this review and many more at: 5171 Miles Book Blog. Thank you to Netgalley and Thomas Nelson Publishing for granting my wish for this book! If you haven't read a Jen Hatmaker book yet, or aren't following her on social media, you're sorely missing out on hilarious honesty that comes when a woman has raised five children, been through a home renovation on television, and accrued the insight of a life working for God. When I saw she was releasing another book, I knew I would enjoy the hilarity Read this review and many more at: 5171 Miles Book Blog. If you haven't read a Jen Hatmaker book yet, or aren't following her on social media, you're sorely missing out on hilarious honesty that comes when a woman has raised five children, been through a home renovation on television, and accrued the insight of a life working for God. When I saw she was releasing another book, I knew I would enjoy the hilarity inside. The first half of this book was exactly that for me. I especially loved Jen's lists titled, "How to Plan a Family", "How to Wake your Children up Peacefully from Naptime", or "How to get your Husband to Fix that Thing He's Been Saying for 3 Months that He'd Fix." These lists included split-your-sides-laughing truths such as, "Make out with your spouse. Have twins, making your child count five in five years" and "Pick up a hammer and walk in the general direction of the broken thing. This should effectively catapult your husband off the couch and into disgruntled service: 'I said I would do that!'" She perfectly describes every middle-class American family's woes in the most comical and relatable sense! About halfway through the book, however, I found myself having second thoughts about this novel as Jen veers slightly left with her thoughts and theology. I felt as if she was trying to appease the World while still relating to Christians - two paths that often cannot parallel. As she goes on to describe loving people, I felt entirely conflicted. I know we are to love all people, include all people at our tables, and serve people as Jesus did. Unfortunately, love and acceptance are not the same things. I fear Jen may misguide people into believing all Christians are doing things wrong, creating an even bigger divide. With a Liberal dose of love, everything can be right in the world. We live in a place where love and acceptance are favored over Truth. That roaring lion, also known as Satan is as sly as a fox. Of course he would use the one good and pure thing we have in the world and convince us we’re doing it wrong. We’re loving to spread tolerance, sure we’re doing the work of Jesus. We’re loving to spare feelings. We’re loving people to death, but losing their most important part when death meets us head on...the soul. The truth is hard to face, sometimes it hurts, but our duty as Christians is to walk in its Light. Unfortunately, with parts of this book, I feel Jen Hatmaker has veered to the shadows. The light is a little dimmer, it doesn’t burn the eyes quite as badly, but still isn’t too dark to see. I wouldn’t look to this book for spiritual guidance or theology, but I did find fun, humanity and community inside the pages. I don't for one minute doubt Jen Hatmaker's Faith or love of God, but I simply don't agree with much of her theology. I think Christians would do well to compare notes with the Bible to find where they should Biblically stand on issues represented in these pages. "Trust me: don't waste your time over-valuing Christian Famous people. It is so easy to cast public figures as prototypes of discipleship or pristine examples of faithfulness, but all that admiration is totally misplaced. I mean this sincerely: only Jesus is worth your full devotion. He alone will never let you down and will always lead you correctly." I was lucky to receive an advanced readers copy in exchange for an honest review of this book. I loved this book from beginning to end. Jen cheers on women through our triumphs and our struggles, through bravely sharing her own. Her vulnerability is relatable and inviting. I found myself snorting and laughing then soberly nodding my head, feeling comfort in some of my own struggles. I will be buying this book for my friends and family for sure!! It is truly for "all the girls!" Of all the Jen Hatmaker books I've read, this one feels like the best one. Maybe it's just the best one for this season of life. (But it's not just for women in one season of life.) Reading this book is like receiving a letter from a dear friend. I couldn't wait to open it and see what she had to say. I've heard it said that the most powerful words are, "Me, too!" Jen Hatmaker, Queen of Authenticity, brilliantly draws her readers into her story with shouts of, "Me, too!" It's reassuring and comforting to know that we're normal in our wondering, searching, and whole hearted quest to live an authentic life, loving Jesus, serving our family in joy, and being a light in our communities. Of Mess and Moxie is full of wisdom for every phase of life, for every woman... it's a breath of fresh air in o I've heard it said that the most powerful words are, "Me, too!" Of Mess and Moxie is full of wisdom for every phase of life, for every woman... it's a breath of fresh air in our over-filtered, social media curated world. Come full stop, pour a glass of wine, cozy up, and enjoy. You aren't alone. You are more than enough. Join the chorus... "Me, too!" Okay - someone gets to go first right? Y'all Jen Hatmaker makes me laugh and cry and sometimes these things happen simultaneously! I was blessed enough to receive an ARC of this new book. I cannot count the number of times that I felt like Jen must have been spying on my life. She is such a relatable writer - she is us! I highly recommend this book and be warned that if you read in public you will get strange looks as you alternately laugh out loud and sniffle! Christians are called to live a holy life; in a way that we are set apart. We are warned in scriptures to compare ALL things to the Bible. Since this was published under a Christian publishing house, written by a Christian woman, advertising a Christian image... I'm kind of shocked that this is so widely accepted as okay when this is so clearly not in line with God's Word. I'm hugely disappointed in the popularity of this book and moreso the publisher, Thomas Nelson. Hatmaker comes across as wan Christians are called to live a holy life; in a way that we are set apart. We are warned in scriptures to compare ALL things to the Bible. Since this was published under a Christian publishing house, written by a Christian woman, advertising a Christian image... I'm kind of shocked that this is so widely accepted as okay when this is so clearly not in line with God's Word. I'm hugely disappointed in the popularity of this book and moreso the publisher, Thomas Nelson. Hatmaker comes across as wanting too much to relate to people "of the world". I think I understand and can appreciate where she's coming from. "Hey, I get you. I'm a Christian, but I have troubles, make mistakes, and do bad things too." While that is admirable and definitely a way to relate to those who don't hold our faith, I feel like she got lost in that attempt to be too relatable. By no means is this a book for anyone looking for spiritual guidance. Hatmaker decides to indulge in many stories to relate to the readers about how she's just like you. That's basically the entirety of this book. When I read 'Of Mess and Moxie' I highlighted phrases, dog-eared pages, underlined passages, attached post-it notes, and wrote exclamation marks in the margins because so much of it spoke to me. When I started writing this endorsement, so much of the book had been marked up that I had a hard time deciding which parts to mention because Jen Hatmaker packed so much truth, humor, love, and guidance into every page. Jen has so much love for women, all women, regardless of their state in life, and th When I read 'Of Mess and Moxie' I highlighted phrases, dog-eared pages, underlined passages, attached post-it notes, and wrote exclamation marks in the margins because so much of it spoke to me. When I started writing this endorsement, so much of the book had been marked up that I had a hard time deciding which parts to mention because Jen Hatmaker packed so much truth, humor, love, and guidance into every page. Jen has so much love for women, all women, regardless of their state in life, and that love comes through on every page. She wants us all to do well, to love well, and to know that we are loved by a caring, kind God. Chapter 8, "No Strings Attached" (which sounds like an awesome a cappella group), should be required reading for every human. Jen humbly tells us her story while sharing the truth of God's love. "The entire story of God reveals a vast, encompassing campaign to love humanity all the way home. It is the clearest picture of Jesus, who we should desire in every heart." The beginning of each chapter has given me a new reading list to tackle since she includes such meaningful quotes from Brendan Manning, Anne Lamott, Thomas Aquinas, and others. Thank you, Jen, for sharing your heart and your gifts in this book. I treasure these words and will return to them when I need encouragement, a laugh, or a reminder of all the good that God gave us. I was blessed to receive an advanced readers copy in exchange for my honest review and let me just say that Jen has done it again!!! Reading Of Mess and Moxie is like sitting down with your bestie and having a conversation. She speaks to our hearts and our minds so openly and without reservation. No matter what season you are walking in right now, this book is for you. I laughed, I cried, I felt loved, I felt like my mess was normal. Definitely one you want to get your hands on and read. Another fantastic addition to the Jen Hatmaker collection of books. As we've come to expect from her books, Of Mess and Moxie is filled with 'How To' chapters, delicious recipes and now wisdom for all the various stages of our lives. Hatmaker's sarcasm fills the pages as she takes us from home decorating to bonus moms. Just when you think you can’t laugh any harder, she finishes with the story of Joseph from Genesis 50. Hatmaker brings it all into focus with “We don’t need to hustle others throu Another fantastic addition to the Jen Hatmaker collection of books. As we've come to expect from her books, Of Mess and Moxie is filled with 'How To' chapters, delicious recipes and now wisdom for all the various stages of our lives. Hatmaker's sarcasm fills the pages as she takes us from home decorating to bonus moms. Just when you think you can’t laugh any harder, she finishes with the story of Joseph from Genesis 50. Hatmaker brings it all into focus with “We don’t need to hustle others through their stories. Or ourselves.” Amen, Sister! Jen Hatmaker proves once again that she is FOR us, and she gets us. This is the type of book that makes you want to get on the phone with friends and say, "Here, let me read this to you." This book will have you laughing and crying and feeling every emotion in between. You will also gets some amazing #JHat recipes out of the book. I received an Advance Reader Copy from Thomas Nelson Publishing in exchange for my honest review. I just love her books. It also makes me want to try harder to have a serious group of friends. Reading Of Mess and Moxie is like chatting with your salty friend who tells you like it is in the most wise, loving, honest, and necessary way. Jen Hatmaker has managed to touch on almost every subject that women are facing today - marriage, parenting, church, friendship, trying to make dinner for kids who will hate it (the list goes on), and share her perspective for healthy relationships and whole-hearted living. From the first chapter when she said "You don't have to be who you first were" (l Reading Of Mess and Moxie is like chatting with your salty friend who tells you like it is in the most wise, loving, honest, and necessary way. Jen Hatmaker has managed to touch on almost every subject that women are facing today - marriage, parenting, church, friendship, trying to make dinner for kids who will hate it (the list goes on), and share her perspective for healthy relationships and whole-hearted living. From the first chapter when she said "You don't have to be who you first were" (life-altering permission granted), to her explanation of how she and her husband process things so differently and have learned to respect each other and lean into their differences, and her hilarious how-tos, I'm pretty sure Jen Hatmaker has a direct line to my therapist. Her words are so timely and needed. Reading this book is like sitting on the porch with a friend who looks you straight in the eye and says, "me too, I've been there, and here's what I've learned." And those are my favorite kind of friends. As a busy wife, mother, daughter, sister, aunt, daycare provider, preteen girls coach, mentor and friend, my life has seen it's fair share of mess. Reading Jen Hatmaker's newest book, "Of Mess and Moxie," has been a breath of fresh air to my soul. It's like Jen looked deep into me and put words to all of the thoughts going through my heart. Regardless of what season of life you are currently in, Jen connects with women in a way that feels like a back porch talk with your best friend. She has hel As a busy wife, mother, daughter, sister, aunt, daycare provider, preteen girls coach, mentor and friend, my life has seen it's fair share of mess. Reading Jen Hatmaker's newest book, "Of Mess and Moxie," has been a breath of fresh air to my soul. It's like Jen looked deep into me and put words to all of the thoughts going through my heart. Regardless of what season of life you are currently in, Jen connects with women in a way that feels like a back porch talk with your best friend. She has helped bring to light that we all have our fair share of mess in these wild lives God has given us, but navigating through them with moxie is where the true fun and happiness comes from. I have some very mixed feelings about this book. From the start, I wanted to love it and the very beginning of the book set me up to do just that. Jen was very intentional about emphasizing that this book was for every woman. She specifically listed women in most all scenarios of life and it made me feel included from the start. That feeling is very important to a woman who doesn’t always feel like she fits. Unfortunately, the content of the book did not match her statement. This book was suppose I have some very mixed feelings about this book. From the start, I wanted to love it and the very beginning of the book set me up to do just that. Jen was very intentional about emphasizing that this book was for every woman. She specifically listed women in most all scenarios of life and it made me feel included from the start. That feeling is very important to a woman who doesn’t always feel like she fits. Unfortunately, the content of the book did not match her statement. This book was supposedly written for every woman, but about 90% of it was geared toward mothers. Much of the content made me feel like it was assumed that the reader would be a mom. This was disappointing and only served to make me feel less included. I realize that Jen is a mom and I’m sure that much of her life story revolves around her kids, but don’t set up a book to be for “every woman” if it’s not. Just saying it is, doesn’t make it so. I also was unclear as to the whole point of the book. There was some humor and a few relatable things scattered throughout it, but mostly it seemed like a random, eclectic set of thoughts on parenting. It really saddens me because even toward the end of the book, Jen talks about being aware of who is around you and realizing that not everyone is in the same place in life. She talks about women whose stories are outside the lines and she acknowledges that sensitivity to that is needed, but yet her book doesn’t live up to her words. While on this subject, she makes the statement “It means considering the stories around the table before launching into an assumed shared narrative.” I absolutely love the idea of this, but if her readers are those seated around the table, she surely is not considering their stories before launching into an assumed shared narrative. I wanted to appreciate her acknowledgement and consideration so much, but how could I when the whole book is about being a mom? Those of us women who live lives that are outside the lines, don’t need anymore reminders that we don’t fit in. The infertile certainly don’t need to hear sections on “How to plan a family” in which she jokes about her husband glancing at her, and becoming pregnant. It’s not that I expect her to not want to write about her experience in parenting, but acknowledge that your target audience is moms. Not. Every. Woman. One last major issue I have with this book is the theology of it. Jen makes comments that seems rather flippant and disrespectful toward Jesus. She also embraces sinful lifestyles in the name of inclusion and love. While we are certainly called to love, we are not called to ignore sin or embrace it. One last thing I loved was near the end. She encourages her readers to fangirl their friends. Cheer and support them and be their biggest fans. I love that thought and wholly believe that we should be supporting each other and cheering each other on. It makes me sad that this book had such an opportunity to really speak to every woman, but it sadly just fell so short. The idea of making sure all women felt included and being considerate of who is around you, is an awesome, awesome thing and I absolutely believe it should be more recognized that not all women “fit the mold” Unfortunately, I finished the book feeling more glaringly left out than before. Jen hit it out of the park with this one. I've never read a Jen book that didn't speak to me, but Of Mess and Moxie took it past that. It's easy to get lost in the mess of life--the mundane, boring, seemingly average mess. OMAM is for ALL the girls--the ones in EVERY stage of life, whether you are looking forward to things, in the middle and need encouraging or if you're looking back with tears & laughter. My mom sat and read portions of the book out loud--and had several moments where we ha Jen hit it out of the park with this one. I've never read a Jen book that didn't speak to me, but Of Mess and Moxie took it past that. It's easy to get lost in the mess of life--the mundane, boring, seemingly average mess. OMAM is for ALL the girls--the ones in EVERY stage of life, whether you are looking forward to things, in the middle and need encouraging or if you're looking back with tears & laughter. My mom sat and read portions of the book out loud--and had several moments where we had to stop reading and breathe because we were laughing or crying or a little bit of both. It's full of real stories and you can tell that Jen has a real heart for sharing with women. I'm already on my 3rd read, and I cannot wait to pass this along to my friends. As a fan of Jen Hatmaker's work, I was thrilled to receive an advanced copy of Of Mess and Moxie. This book is the perfect follow-up to For The Love. Jen invites the reader to embrace who they are while at the same time gently encouraging them to be the person that God has made them to be. While Hatmaker is a Christian author, Of Mess And Moxie, has something for everyone on the Christianity spectrum. My young son was very upset with me for writing so much in this book, since WE DO NOT WRITE IN BOOKS. But I couldn't help myself. Jen's words just call out to be underlined, circled, arrowed, asterisked, and amened all over the place. You're going to need a fancy new pen or five. This is for all of us who need grace - that is to say, all of us. Highly recommended. Jen Hatmaker is the author of the New York Times bestseller For the Love and happy hostess of a tightly knit online community where she reaches millions of people each week. She and her husband, Brandon, founded the Legacy Collective, a giving community that granted more than a million dollars in its first year. They also starred in the popular series My Big Family Renovation on HGTV. Jen is a mom Jen Hatmaker is the author of the New York Times bestseller For the Love and happy hostess of a tightly knit online community where she reaches millions of people each week. She and her husband, Brandon, founded the Legacy Collective, a giving community that granted more than a million dollars in its first year. They also starred in the popular series My Big Family Renovation on HGTV. Jen is a mom to five, a sought-after speaker, and a delighted resident of Austin, Texas, where she and her family are helping keep Austin weird. For more information, visit jenhatmaker.com.